Supplier and Vendor Management - Avoid RISK MANAGEMENT! Management is asking for DOCS – ASAP!!! Important Agreement signed last week. You ask yourself … “Where is that Contract – I know it’s in HERE somewhere I just saw it last week. I know it was filed … Account name or by service? I can’t find it!” Meanwhile, management is still in meeting waiting for the signed Agreement. How would your company benefit from a Centralized Information Base? REMOVES the BURDEN of not being able to RETRIEVE what you need RIGHT WHEN you need it. REMOVES the TIME LOST looking or replacing documents that GET LOST in the shuffle of PAPERWORK. REMOVES the STRESS caused by management needing the information IMMEDIATELY. 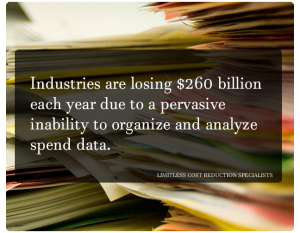 REMOVES the NONCOMPLIANCE produced by the inability to document legal documents and warranties effectively. 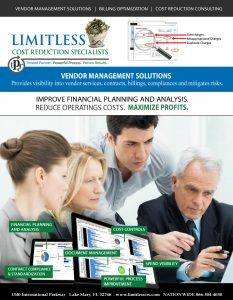 LIMITLESS Vendor Management Solutions is THE Vendor Management Solution Software that brings Superior Spend Analytics and Visibility within a FULLY MANAGED software solution. Contact LIMITLESS for more information.